"Can a school save a community? 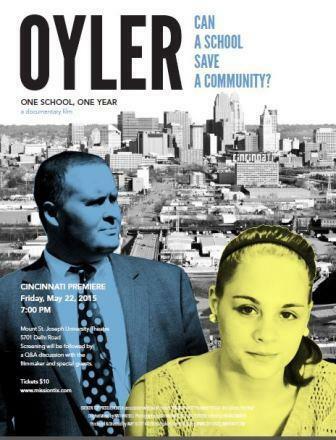 "quickly became the tag line for the documentary OYLER, which premiers locally tonight. The documentary OYLER: One School One Year follows Craig Hockenberry, the school's principal when the film was produced, through a year at the school, focusing on Hockenberry's mission to transform a community battered by crime and poverty, and on then-senior Raven Gribbins quest to become the first in her family to finish high school and go to college. The documentary, produced in association with American Public Media's Marketplace, has its local premiere this evening at Mount St. Joseph University. Joining us to discuss the film and the school, are former Oyler principle, Craig Hockenberry, who is now superintendent of Three Rivers Local School District; Oyler graduate Raven Gribbins, who is now studying at Penn State Greater Allegheny; and, producer of the film OYLER, Amy Scott, education correspondent for Marketplace. The film OYLER: One School One Year has its local premiere tonight at 7:00 pm in the Mount St. Joseph University Theater, followed by a panel discussion, moderated by WVXU reporter Bill Rinehart. For information click here.